The Royal Hawaiian takes luxury to a whole new level. Besides providing Wi-Fi, valet parking and 24-hour room service, this resort also offers laundry and dry cleaning services, high quality and top rated restaurants and bars, spa and salon, and traditional cultural activities. They are also one of two hotels in Hawaii that has their very own private beach. If that doesn’t spark your interest, then the view from the hotel alone should be reason enough as you will have phenomenal views of either Diamond Head or the Pacific Ocean. Take advantage of one of the provided 18 oceanfront rooms or relax in a beachfront cabana. The moment you step into the lobby, you’ll be asking yourself why you haven’t stayed there before! The Hyatt Regency gives you the best of both worlds – easy shopping access to high quality boutiques and outlets as well as close proximity to the beach. This resort faces the Pacific Ocean and offers 1,230 rooms that include top to bottom windows. If you forgot to bring a beach towel or desire a beach chair, they’ve got you covered. Participate in classes during the week such as lei making or ukulele. Make sure you stick around on Friday for Aloha Fridays that include thrilling fire-knife dancing and live Hawaiian music. Hyatt Regency is the perfect stay for both couples looking for a relaxing getaway and families who are ready to enjoy every bit of the Oahu life. Families are what Ohana Waikiki East does best. With a comforting atmosphere, great value, and fun flare, it’s got family-friendly written all over it. 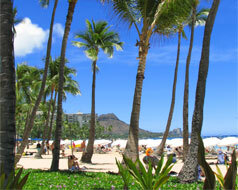 This hotel offers some of the best top of the line rooms available in Waikiki. Some rooms even offer kitchenettes for those who prefer making their own cuisine. For those who don’t feel like cooking at all, enjoy a variety of dining including some Italian fare at Appetito! The beach is only one block away, just mere steps from the lobby. There is no shortage of shops, food, and an avenue of making memories. If any hotel can brag about their location, the Hilton Hawaiian Village has every right to do so. Located just 10 minutes away from Pearl Harbor, 25 minutes from the airport, and 5 minutes from the largest shopping mall in Hawaii, the Hilton Hawaiian Village is perfectly situated. Kids within the ages of 5 and 12 can enjoy a myriad of activities at Camp Penguin while the adults unwind at the Mandara Spa or practice their hula skills. Everyone in your party will get absolutely spoiled with fabulous dining experiences every night. Plus, don’t forget to watch their phenomenal fireworks show every Friday night! The Hilton Hawaiian Village gives newlyweds, couples celebrating a special event, and families the vacation of a lifetime.